LIke any other object in the Windows world, services are objects, you can therefore give users rights on them. Let’s see for example how to allow start stop service rights to non-administrators. In order to change the permissions to a service, you’ll need an account who has rights to change permissions on that service obviously. This means being local administrator of the box or already having that “Full control” right on the service. You’ll also need to retrieve the SID of the users or groups you want grant access. This is a security descriptor in SDDL format which is stored in the Security value of the Security registry key under the keyname in HKLM\CurrentControlSet\Services. The <Something> after the D: is what we are interested in, these are the security permissions. The second part after the 2 semicolons is the permission set and the letters depend on the object you’re working on. You must read them by pair. Do not forget we must put this in the “D:” part of the SDDL! In that case, check you have a valid SID and there is no space in all the string. 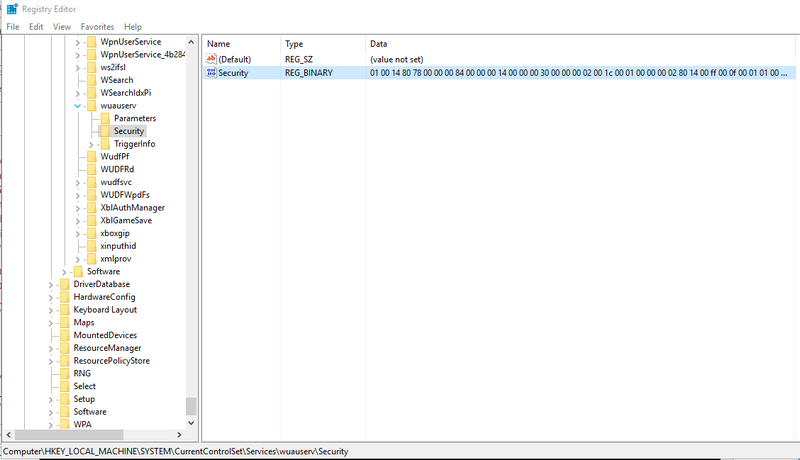 You can also verify that the registry value “Security” under HKLM\CurrentControlSet\Services\wuauserv\Security had its contents changed.